January 2nd celebrates the 99th anniversary of Isaac Asimov's birth. Happy birthday Mr. Asimov! Isaac Asimov was born in Petrovichi, Smolensk Oblast, Russia, at some point between October 1919 and and January 1920. Throughout his life, Isaac chose to observe his birthday on January 2nd. Isaac and his family emigrated via the SS Baltic in 1923. Though his family practiced Orthodox Judaism, Isaac did not grow up practicing. Asimov is remembered for the tremendous amount of writing he accomplished. He published in 9 out of the 10 Dewey-Decimal categories; Asimov did not publish any philosophy, which typically is found in the 100's. 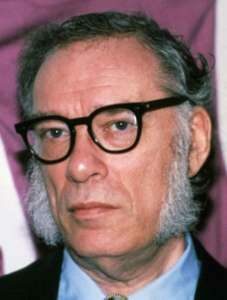 In total, Isaac Asimov has written or edited over 500 works. Between 1939 and 1958, Asimov mainly published science-fiction short stories and novels. After the launch and orbit of Sputnik I, Asimov and many other writers switched gears to writing non-fiction and textbooks at a time when many Americans perceived a technology gap between America and the Soviet Union. Asimov returned to writing more science-fiction from 1982 until his death in 1992. A robot may not injure a human being, or through inaction, allow a human being to be harmed. A robot must obey the orders given by a human being, except where they conflict with the First Law. A robot must protect itself, except where doing so contradicts the First and Second Laws. Asimov's Laws of Robotics and his novels involving them have influenced and continue to influence robotics engineers. Years later, many of his fans celebrate National Science Fiction Day on his birthday. The first recognition of this celebration is unrecorded. Want to see what else we have? Feel free to check our catalog for more books and ebooks by Isaac Asimov.